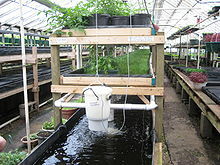 An aquaponics system at Growing Power, an urban agriculture organization in Milwaukee, Wisconsin, USA. Water from tanks of tilapia or perch is pumped upwards and fed to potted tomato and watercress plants. The water is reoxygenated as it flows back into the tanks under the force of gravity, and the plants remove nitrogen from the fish waste in the water. Blend of aquaculture +‎ hydroponics. The tomato may in fact have absorbed a flavor from the soil in which it was grown, one granted neither by the sand of Florida's winter tomatoes exported North, nor by hothouse aquaponics. The warm water in which [Donnie] Tenney's tilapia swim and grow is pumped from the fish tanks to beds nurturing basil, rosemary, and cucumber, then drained, filtered, and recirculated to the tilapia. The hybrid aquaculture-hydroponics system, dubbed aquaponics, uses pumps, aerators, greenhouse lights, and fans all powered by natural gas from an abandoned gas well. Pumps send the dirty fish water up into beds of watercress, which filter pollutants and trickle the cleaner water back down to the fish – a symbiotic system called aquaponics. This page was last edited on 19 February 2019, at 02:29.